Commander Benjamin Sisko takes command of a distant space station recently acquired from the Cardassians, only to learn that it sits near the entrance to a stable wormhole to the Gamma Quadrant. It's hard in retrospect to appreciate how big a gamble Deep Space Nine was when it first aired. Up until this point, the entire Star Trek franchise was defined as "the voyages of the Starship Enterprise," the flagship of the Federation and a shiny example of every good thing our future could become. However, as I've chronicled during my rewatch of Star Trek: The Next Generation, the writers have had a hard time staying within Roddenberry's parameters and have occasionally moved into murkier territory. Here, in the opening episode of Deep Space Nine, it is made abundantly clear that the writers and producers are willing to delve a little deeper into the murk, and it is done in an ingenious way. For one thing, "Emissary" is told almost exclusively from the point of view of one character: Commander Benjamin Sisko. Sisko is a man tortured by the trauma of his wife's death at Wolf 359, an event he has been unable to move beyond, and has been assigned to a distant outpost at the limits of Federation space. In order to show how different Sisko is from what we've come to expect out of the Enterprise adventures, the writers bring Captain Picard--the ultimate personification of Federation morality and cleanliness--as the first of many emissaries in the episode. Picard is an emissary between TNG and DS9, and there is no better way to show the dichotomy than by exploring the differences between him and Sisko. Picard is a man who expresses love for Bajor and maintains a sense of duty to Starfleet above all else, whereas Sisko seems ambivalent about the Bajorans and openly talks about leaving Starfleet. Picard's sense of duty has kept his personal life restrained, but Sisko's loyalty to the Federation is secondary to his concerns about how to raise his son in an environment that isn't "ideal." 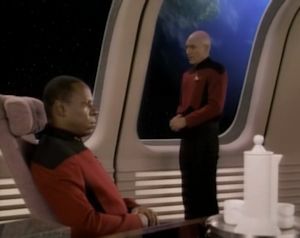 Picard has a heavy conscience and sense of morality, but Sisko shows almost immediately (with his dealings with Quark) that he is willing to lie and manipulate to achieve his ends. Indeed, the two scenes with Picard and Sisko (the first of which takes place on the Enterprise and the second aboard Deep Space Nine) are filled with barely constrained tension. Sisko has a hard time seeing Picard as anything but Locutus, the Borg responsible for the death of his wife, and Picard has a hard time finding respect for a man who seems aloof towards both the plight of the Bajorans and to his sworn duty to Starfleet. In other words, these men are so alien to one another that they could never be friends, and that helps prepare the audience for the new tone of the new show. TNG and TOS are about exploring the "final frontier," but DS9 promises to stay relatively still. TNG and TOS deal with ever-changing adventures that change week to week, but "Emissary" offers up a setting that is too complex to fully explore one episode at a time. With Bajorans and Cardassians constantly feuding and with the Federation too far away to be of much help, the politics of Deep Space Nine are far more complicated and potentially explosive, and with the revelation of a stable wormhole to the Gamma Quadrant, it is assured that the balance of power in the region will remain in constant flux. The station itself only has a handful of Federation representatives aboard, filled instead with aliens who don't answer to Starfleet authority. There's gambling with the Ferengi, a Bajoran "major" who serves as yet another emissary between the Federation and Bajor, a mysterious shape-shifting security officer who seems to have his own strict moral code, and Cardassians sitting right nextdoor, looking for weaknesses to exploit. It is clear that Sisko has to use whatever tools he has available to keep things in control, and the situation he finds himself in isn't one a man like Captain Picard could easily handle. Sisko, despite his apparent exhaustion with life, seems to take it all in perfect stride, unburdened by ethical concerns that would overwhelm the characters of TNG. "Emissary" also introduces a more spiritual/philosophical tone once Sisko is introduced to Kai Opaka, and later when he communes with the non-corporeal aliens at what appears to be the "celestial temple" of Bajoran religious folklore. The aliens struggle to understand Sisko, and through explaining his existence to them, Sisko finds the motivation he needs to move beyond his inner demons and find purpose in his new assignment. It's a much deeper exploration of ideas that previous Star Trek shows have only danced around, and thus DS9 promises to eschew simple moral themes for more ambiguous and difficult meditations. The characters, too, offer a wide range of potential to do the same. Major Kira seems to be a retread of Ensign Ro, though her more prominent position on the crew is a guarantee that her character will be more fully explored and exploited. Quark, as a Ferengi bar owner ("a gambler and a thief"), is something we've never seen given much attention in Star Trek: a shady cynic who isn't as swayed by matters of conscience as much as he is by matters of self-interest. Odo is easily the most mysterious character in the bunch thus far, with only one heavy-handed exposition about his unknown past to guide us into what will inevitably be an interesting backstory. Even some of the Federation characters are deeper and more ambiguous than usual. Jadzia Dax is a trill with multiple lifetimes of backstory to explore, and Chief O'Brien, though we are introduced to him as a side character in TNG, is more of a spit-and-polish kind of guy than we are used to seeing in a Federation uniform. Even Doctor Bashir, who is introduced as the most one-dimensional main character, appears to be driven by his own desire to be a hero of the frontier instead of anything noble like his honor or duty. As a way to sell audiences on this bold new endeavor, "Emissary" is a success. However, it isn't a perfect sell, because we aren't given any assurances that the show will continue to be exciting or provocative, nor are we given any reasons to truly like any of these new, morally ambiguous characters (aside from Sisko). It is far from certain that DS9 will live up to the promises of this first episode, but as a first episode, it is at least better and more mature than TNG's "Encounter at Farpoint."